I have been contemplating a new minimalist quilt for weeks now, in fact I started thinking about it right when I finished 'Tuscan Hills'. I had in mind to make a quilt that uses only whites and creams in all sorts of shades and textures. Right at the beginning of my quilting I made 'Double Cream' which is still one of my favorite quilts (sorry for the bad quality images) and ever since I wanted to make another quilt with a similar colour palette. Then came along our LMQG challenge for May and an exhibition. 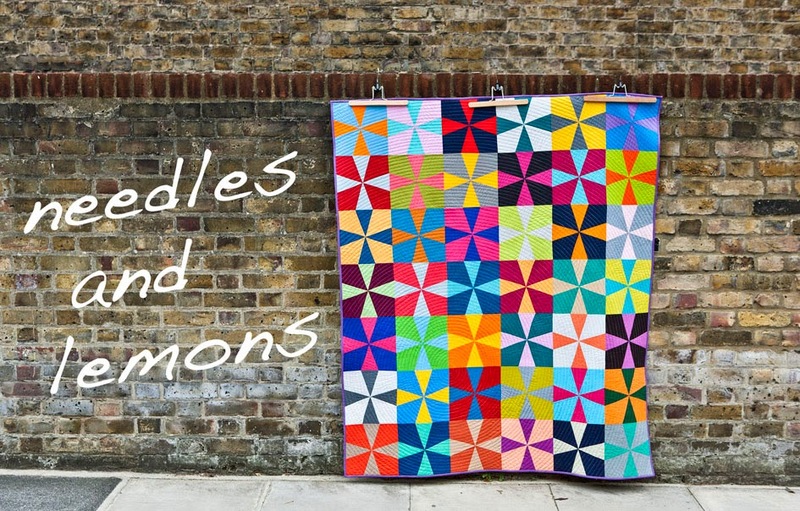 John Lewis have offered us to exhibit 12" mini quilts in their Bistro at their flagship store on Oxford Street. How cool is that ! And that got me thinking that I could make a mini quilt in creams as a little study to the actual bigger quilt I am planning to do. So I started thinking what modern or contemporary quilting actually means to me. I think in the main it means a total freedom of colour, fabric, form and texture and with that in mind I started planning for which I used for a change EQ7. I bought the software several months ago but it took me rather a long, no actually a very long time to get used to it. But I will write about my EQ7 experience another time in more detail. And while I was planning my favorite red fabric ('Cranberry' Oakshott used here and here) caught my eye and I thought I could use a splash of it in this little quilt. 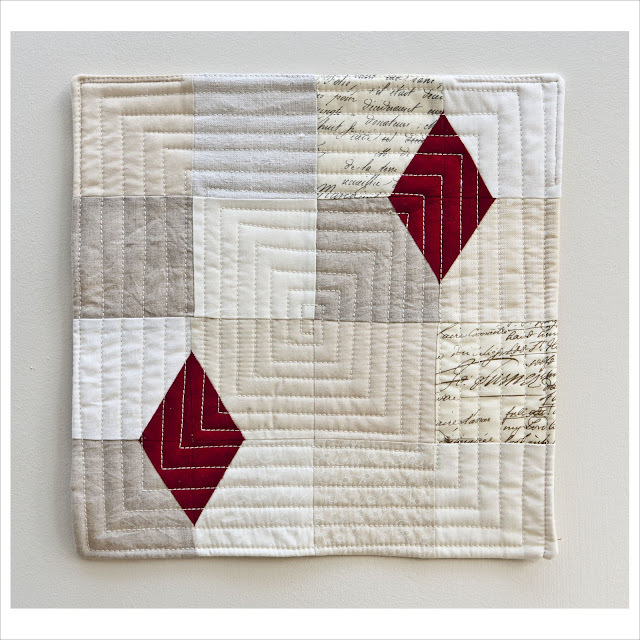 And so came about this mini quilt 'The Red Diamond'. I created a paper piecing template for the 3 inch squares with the red corner and went about cutting and piecing. A few hours later my entry to the first LMQG exhibition at John Lewis London was done ! I can't tell you how happy I am about it and of course it got my little brain into overdrive about the bigger version of it. Let's hope it will be in the selection. Ooh, I like that. And how you've quilted it. Judith this is beautiful, I love it. A bigger version would be amazing. Oh I love this! I've been planning something similar if we all go again in the Brit Bee. I 'ove that you've added some text fabric in there. Very cool! Would love to see a big version of this. Can't believe that Fiona is saying that was her next plan because it was mine too. Oh no!!! I was going to do it last summer until the Go! Baby showed up and I went with the DPs. I love it, this just a perfect mini and it will be stunning as a larger quilt too. It;s beautiful, I love everything about it. I love everything about this little mini. Tres chic! Love the minimalist arty feel!